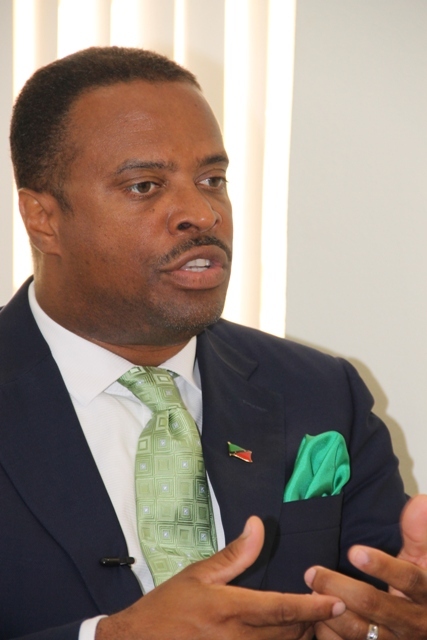 NIA CHARLESTOWN NEVIS (MARCH 19, 2015) –Deputy Premier in the Nevis Island Administration (NIA) Hon. Mark Brantley, who recently assumed two Federal portfolios in addition to his NIA responsibilities, said handling the dual roles require the involvement of staff and the highly competent technical people in both Nevis and St. Kitts. The Minister’s comment came in response to a question on how he was coping with the added responsibility posed by the Department of Information on Nevis on March 17, 2015, at his Bath Hotel Office. In the NIA he also holds responsibility for the Ministries of Tourism, Health, Gender, Social Affairs, Social Development, Youth, Sports, Community Development and Culture while in the Federal Government, he is responsible for the Ministries of Foreign Affairs and Aviation. “I have great praise for the people who I work with locally here in Nevis and indeed those that I have just been exposed to in the past month or so on St. Kitts and I depend heavily on them to update me, to keep me abreast of all that is happening, and where necessary, for my intervention,” he said. Brantley noted that the dual roles were so far challenging but attainable. He stated that the most challenging aspect has been the constant demand for travel that the Federal Ministry of Foreign Affairs generates. “Literally almost weekly, meetings are being demanded in various capitals of the world and so I have to manage that of course with also the need to be here locally to take care of certain things on the ground,” he said. However, he explained that the portfolios which had been allocated to both Premier of Nevis Hon. Vance Amory and himself were complementary to those portfolios they already held in the NIA. “Tourism, for example, is complemented by Aviation. Airlift is very important and so we are trying to partner those so that both islands benefit more from tourism and from airlift,” he said. Regarding his portfolio of Foreign Affairs, Mr. Brantley described it as a significant ministry through which virtually every government-to-government contract comes, whether it is scholarships to foreign countries and institutions, international aid or discussions with ambassadors. “In taking that ministry, it has put me at the very forefront in terms of the diplomatic effort. I think the Prime Minister referred to me as the Diplomat in Chief and that is really what it entails.It is really something that is rigorous. It is ongoing. “It requires effort but as I say I have an excellent staff in St. Kitts. We have excellent people at our embassies throughout the world and we are now in a process of augmenting that and increasing our presence and our diplomatic footprint regionally and internationally,” he said.